Inside this special section, you’ll discover fantastic offers and competitions exclusive to Holland & Barrett’s rewards for life members. Don’t have a card? Sign up today to start claiming your rewards! Turn to page 146 to see how to get started. 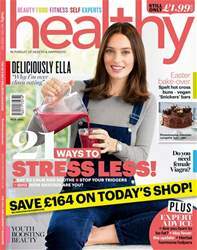 Discover your #healthystressbuster of choice in our May issue of healthy, which features one of our favourite wellbeing warriors, Ella Mills (aka Deliciously Ella). We’ve rounded up 21 ways to conquer stress, including food to keep you calm and an exclusive feature on anxiety – take the quiz to find out how it affects you! Next up, give Easter a ‘bake-over’ with our inspiring recipe pages, featuring spelt hot buns and vegan ‘Snickers’ bars. Plus! We ask: do you need female Viagra? And are you born to be fat? Find out more in the brand new issue of healthy. SHOULD YOU TAKE A FEMALE ‘VIAGRA’? ARE YOU BORN TO BE FAT? WHEN SHOULD YOU PAY TO SEE A SPECIALIST? What happens when my… HAIR GOES GREY? NO NEED TO RESIST THIS! HOW DO I UNWIND AFTER EXERCISING?